A satellite view of the Norske Hydro Alunorte facility as seen from space. - Source: a Satellite image from Google Maps. Norsk Hydro’s Alunorte refinery in Barcarena accused by local authorities of contaminating the waters of communities with toxic waste overflowing from a holding basin. Hydro Alunorte refinery started its operations in 1995, since then it supplies domestic markets but mostly international ones (as 86% of the production goes for export). The plant transforms a mineral abundant in the Amazon, bauxite, into alumina. The refinery’s owners are today Norsk Hydro, whose main shareholders are the Norwegian state (34,3%), the Norwegian Government Pension Fund (6,81%), and several transnational financial corporations. 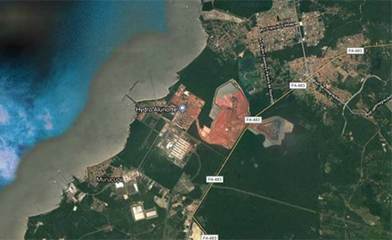 The factory Albras (Alumínio Brasileiro S.A.) transforms Alunorte’s alumina into aluminum and is owned by Norsk Hydro (51%) and the Japanese consortium NAAC (Nippon Amazon Aluminum Co. Ltd) (49%). Industries in the region also include, amongst others, steel plant Usipar and kaolin processing Imerys Rio Capim Caulim S.A. and PPSA (Pará Pigmentos S.A.). Since the 2000´s irregularities were detected by public entities such as the Instituto Evandro Chagas (IEV) from the Ministry of Health. Scientific experts from the IEV detected water pollution in the community of Barcarena threatening the environmental and human health. Especially children which some of them were previously diagnosed with skin and visual problems related with water pollution according to the doctors. Workers of the company have also been affected. By that time, IEV confirmed that water pollution was caused by leakage and toxic waste of Hydro Alunorte. The whole process of producing aluminum is in fact water-and energy-intensive and is highly air-polluting. One of the most important leakage was in 2009 when the company contaminated important rivers with lead and mercury. In that year, the company was fined with (R$ 17.000.000) but it never paid. The company admitted it discharged untreated rain and surface water into a river, which it called “unacceptable,” but has denied significant parts of prosecutors’ allegations and has said there was no evidence of a lasting environmental impact. Dwellers and local organisations with the support of Movimento dos Atingidos por Barragens (MAB) have highly denounced this situation against Brazilians authorities. Violence against environmental defenders is visible, Paulo Sérgio Almeida Nascimento who was active in denouncing the company was shot dead in March 2018 he was the leader of the Associação dos Caboclos, indígenas e Quilombolas da Amazônia (CAINQUIAMA) an environmental justice organization who denounced the company several times. Based on death threats Paulo had asked for governmental protection but it was denied which resulted in his death. In May 2018, a Brazilian federal judge upheld a state court decision forcing Norsk Hydro to cut output at a major alumina refinery, after the metals maker admitted to making unlicensed emissions of untreated water during severe rains in February. As a result, the company was ordered to slash output by half at the refinery  . Name Hydro Alunorte alumina refinery in Barcarena, Pará, Brazil. - After 20 years in operation, the company supplies the domestic and international markets. -Currently, Hydro Alunorte exports its products to ten countries in the Middle East, North America and Europe. -Since it was inaugurated in 1995, the refinery has undergone three expansions that increased its production capacity, all of which were implemented without any production downtime. - The company generates around 4,400 direct and indirect jobs. - The 14% of its production is for internal consumption and 86% for exportation. "According to studies made of the soil, the leaked material had high concentration of iron, aluminum, zinc and cadmium—these accumulate in the body and may cause degenerative diseases, hepatic dysfunctions, immunological deficiencies, and dementia." Why? Explain briefly. On April 2018, the federal court ordered the partial suspension of mining activities in Barcarena. Alunorte - Alumina do Norte do Brasil S.A.
Veja que na grande imprensa — e na reuters — a NOrsk NEGAVA o vazamento!!! by Diana Aguiar (FASE), Alessandra Cardoso (INESC), and Marcela Vecchione (NAEA/UFPA). A satellite view of the Norske Hydro Alunorte facility as seen from space. Source: a Satellite image from Google Maps.